An eminent supreme court lawyer and social activist in India, has fought over 500 Public Interest Litigation cases without charging any money, including the recent 2G Scam, appointment of Thomas as Chief Vigilance Officer for India, Doon Valley case, Bhopal gas tragedy litigation, Narmada dam case, and many more to protect the environment, to defend the rights of indigenous people, and to fight rampant corruption in the government and the judiciary. He represents the conscience of the Indian judiciary system, and is leading the fight to stop corruption and to restore people’s democratic rights. 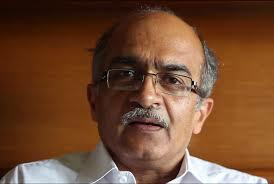 Prashant Bhushan has been defending democratic and people’s rights in India all his adult life, starting with fighting against the emergency declared in 1976, and in 1978, at age 21, he authored a related book, “Case That Shook India.” Subsequently in 1990, he focused on the issue of corruption in government and authored the book, “Bofors: The Selling of a Nation.” He was recently appointed as a member of the committee constituted in April 2011 for drafting the Jan Lokpal bill. He has been leading the fight to stop corruption and to restore people’s democratic rights.